Meanwhile, Luol Deng and Taj Gibson missed Wednesday’s practice as both stayed home sick. Thibodeau was hopeful they will be able to play on Thursday, when the series returns to the United Center and the Bulls get a second chance to close out their seven-game series against the Nets. 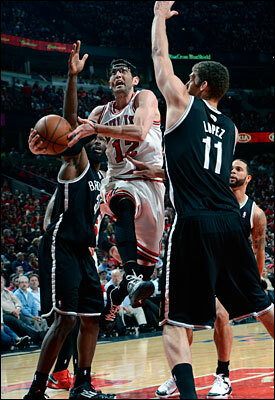 “I’m doing better, seeing some improvement,” said Hinrich. “Right now, just kind of the same deal, taking it day to day, and just throwing everything at it to try and improve it as quickly as possible. Though he missed Game 5 in Brooklyn, Hinrich has taken some steps forward since suffering the left calf injury as he played nearly 60 minutes in an epic Game 4. He’s no longer wearing a walking boot and some of the swelling has subsided. That trend needs to continue in order for him to regain enough mobility to take the floor. In some better news, Joakim Noah said he is “feeling good” and ready to play another 30 minutes or more. Noah said he’s focused on helping the Bulls win the war in the paint, a key factor in the deciding outcome of all of the meetings between Chicago and Brooklyn this season. As for Thibodeau’s game plan, he’ll stick with the fundamentals of what has worked for the Bulls all season long – emphasis on defending, rebounding, limiting turnovers, playing inside-out, and sharing the ball. He added that a little extra determination on the defensive end could go a long way against the Nets’ explosive offense. Thibodeau and Hinrich were also asked about the comments made by TNT’s Steve Kerr during Game 5 in which he suggested that Derrick Rose owed it to his teammates to come back and play this postseason, even if it were for limited minutes. While Kerr reasoned that frustration could be derived when seeing Noah and other players persevere through injuries, Thibodeau countered that the comparison is off base. At the end of the day, Rose has the team’s support in how he’s handling his situation.